Writing out or typing in contacts to your new phone is “old school”, with Google free cloud services; you can move all your contacts to any of your new devices within seconds. Using the Google Contact Sync services, you can store all your contacts in Google Cloud Service and then sync them with any device when you login with your Google account. 1. On your old Android device, open “Contact” list. 2. 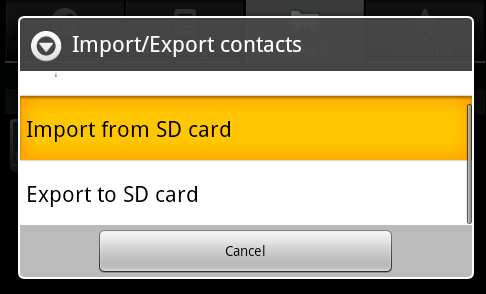 From the “Options” (: at the corner), select “Import/Export”. 3. On the “Copy from” screen, select “Phone Contact”. 4. On the next “Copy to” screen, select your Gmail account. 5. Follow the instructions and it will start copying. You contacts will be on Google servers and you can access them anywhere. 6. On the new device, repeat Steps (1) to (4) but in Step (3), you now copy from your Gmail (Google) account to your “Phone Contact”. 7. Depending on the size of your contact list, it should take less than 2 minutes for all your contacts to appear on your new device. You can also use this method to save all your contacts to a single .csv file on your memory card which you can thereafter transfer to any device that can read .csv file and import them to contact.